GoWild Casino is no stranger to fun promotions and amazing games created by a leading online casino software developer, Microgaming, and this is no exception. Fish Party is a brand new slot machine from Microgaming, the biggest name in software developers for online casinos. This latest release is a five reel slot machine that offers 243 ways to win as players dive down under the sea, looking to haul up the 90,000 credit jackpot that awaits in this game full of wild and wacky fish. Just one of the great features included are the gamble option which allows players to chance their last win for the opportunity to take twice or four times their winnings to the bank on the next spin, a relatively new addition to Microgaming's bag of tricks. There's no shortage of fun happenings in this fresh cartoon animated slot machine with Super Stacked Wilds and as many as 20 or as few as 8 free spins offered throughout by stacking up Scatters and the chance to retrigger them by collection 3, 4, or 5 Scatters while the free spins play themselves out. Not only can the game help you to win big in that way but there are also bonuses which stack up more and more of the reel symbols which give bigger payouts. Reel symbols include many variations of silly party fish, Scatter clams, starfish, hooked worms, the Fish Party logo which also serves as the Wild, and more. 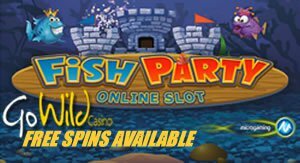 Claiming your free spins for Fish Party with GoWild Casino is as easy as heading over to the site and creating a new Real Money account. From there, contacting the support line, which is available to help 24/7, will get you 25 free spins for this game. On top of this great starting offer, GoWild offers a welcome package for new players which gives 100% deposit matching up to $200 for first time players. Giving players the chance to begin with extra money in the bank and a head start towards the Fish Party jackpot is another example of what makes GoWild Casino the popular online gambling destination that it has become.